Welcome to this month's Stampers Dozen Blog Hop - we are excited to be sharing some products from our upcoming Holiday Catalog! My card features the new Spooky Cat bundle, which consists of the Spooky Cat stamp set and Cat Punch. I am predicting that this punch will be as popular as the Daisy punch has been! The great thing about this cat punch is that it not only coordinates with the cat in the stamp set, but it also coordinates with the Spooky Night Designer Series Paper (DSP) - there are two 12 x 12 sheets of orange and black cats that "work" with the cat punch! 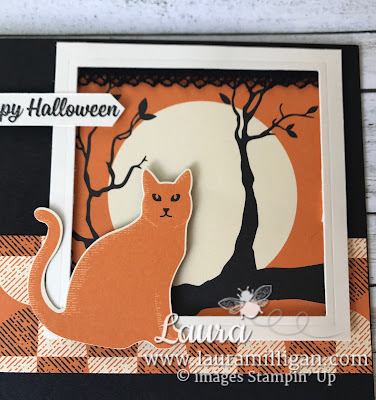 I counted at least 30 cats on each 12 x 12 sheet! That's a lot of cats! The tree and moon were also cut from the Spooky Night DSP. This paper makes crafting so quick and easy! I used a card base of Basic Black cardstock, and added a strip of Spooky Night DSP, attaching with SNAIL adhesive. Next, I created the focal image of the card. I cut a 3 3/8" square of Very Vanilla cardstock, and created a frame using the largest square in the layering square framelits and my Big Shot. I cut one of the Moon/Tree images from the Spooky Night DSP and added a piece of Basic Black Vintage Crochet Trim across the top. I positioned my Very Vanilla frame over this with mini dimensionals, and attached to card front. I punched a cat and added her to the side of the frame. 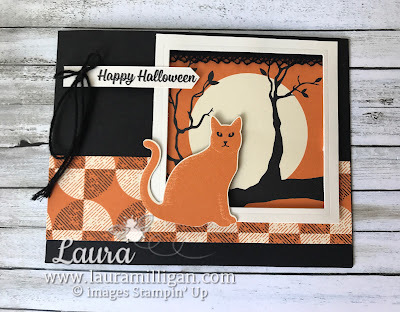 To finish the card, I stamped "Happy Halloween" on a piece of Very Vanilla cardstock, added a Black Baker's Twine bow and attached to the card front. The hat is also from the Spooky Nights DSP! 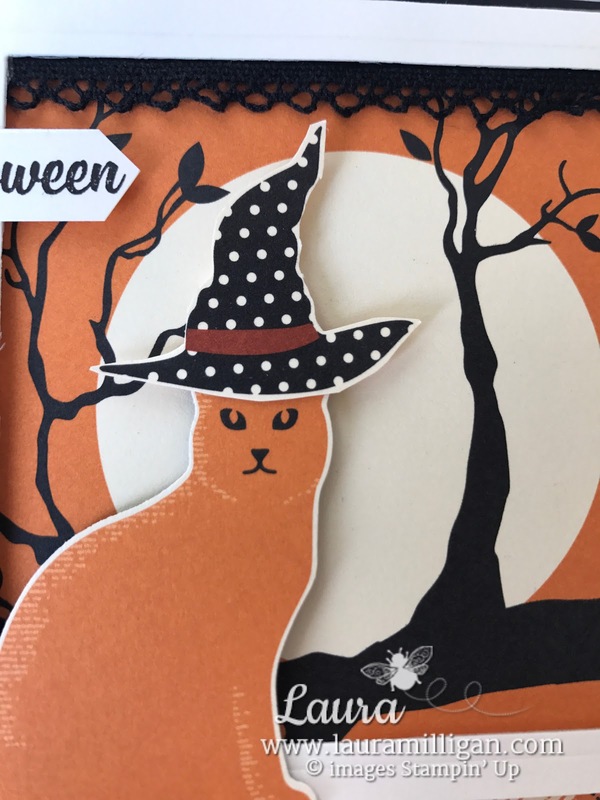 Just cut it out and attach to cat. Which is your favorite? With or without the hat? Would love to hear from you! 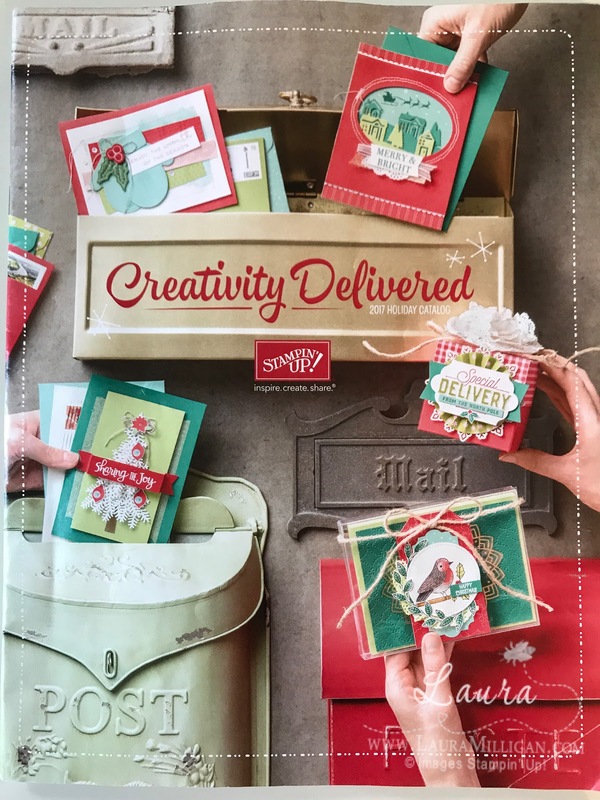 Can't wait for the Holiday Catalog to start - Sept. 1 is the day! Need a catalog? 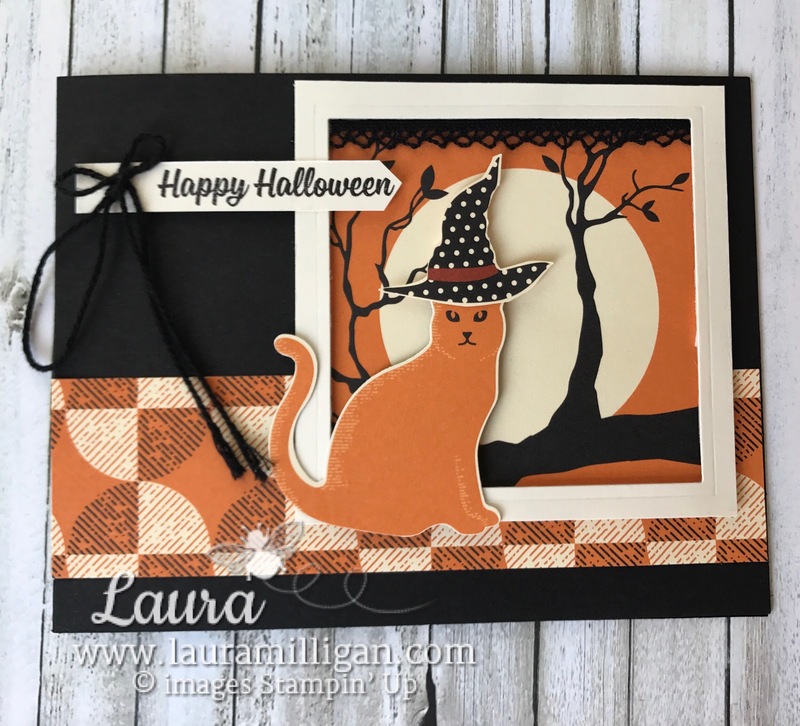 If you don't have a demonstrator and would like a copy of the holiday catalog, please send me an email at laura@lauramilligan.com and I will happily send one your way! Basic Black - card base 5 1/2" x 8 1/2", scored at 4 1/4"
part of the dsp and don't need to be measured! I can not wait to get this set!